Woodlander Carriages offer the most elegant form of transport with which to travel to and from your wedding ceremony, a horse drawn carriage. With the choice of several wedding carriages to choose from, you can select the perfect choice for your big day. 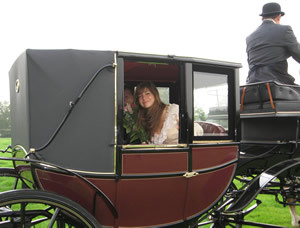 The elegant glass fronted Landau carriage is drawn by two beautiful Suffolk horses. The Landau carriage is glass fronted which enables the occupants to be seen when the hood is up against inclement weather. These can be folded down to convert Landau to an open top carriage in fine weather. It will take four adults and is pulled by a pair of wedding horses. The colour is black with burgundy side panels and depicted with gold lining. The Driver sits on a high seat on the front. 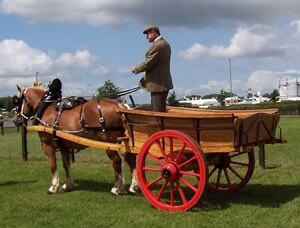 For those who may wish to have a more rural Thomas Hardy effect there is a very attractive Somerset Wagon and a traditional Putt Cart available, perfect for your wedding requirements. To view our gallery of horse drawn wedding carriage photo's click here, or for more information on horse drawn carriages click here.